Our library joins with the American Library Association and other public libraries nationwide to make sure that every student has the most important school supply of all – a library card. Sign up for a library card anytime during the month of September and receive an incredible tote bag (while supplies last)! To sign up, patrons 18 and older must present a photo ID with current address. If the ID does not have the current address, please provide a personal check or piece of mail forwarded by the post office for proof of current address. 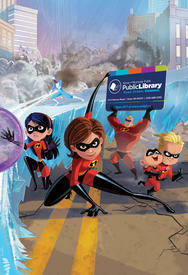 Those under 18 may sign up for a library card accompanied by a parent or legal guardian. A library card at the Stow-Munroe Falls Public Library means access to all our materials, computers, and free internet access. Enjoy all the perks your card has to offer, and be sure to share what your library means to you with your friends, family and colleagues who don't have their own library card. Tell them the true value of libraries and how the library benefits you.